I know, I know. I'm breaking some deep-rooted Southern mannerisms today by talking about money. But I keep seeing so many questions by brides on wedding message boards about paying for wedding photography, that I thought it better to talk openly than to let it sneak up on those in the midst of planning (or hoping to plan soon!). When I first began my career as a wedding photographer, one of my brides had to mail me her final wedding photography payment from her honeymoon destination. I can only guess that the feelings of post-nuptial bliss, joy and tranquility were not present as she and her new husband raced around the island looking for the one and only small post office. Many brides know a 50% deposit is usually required to secure wedding photography services--so that both parties are equally committed to the big day--but the final payment still seems to be a small mystery. I cannot speak for every photographer in my industry, but I will say that worrying about writing a handful of checks on your wedding day or finding a post office on your honeymoon is not the kind of stress I want to impose upon my clients. In my experience, both having been a bride and now working in the wedding industry, full payment for services in advance is standard for many vendors. Starting two months before the big day, I work closely with my clients to make sure every last detail of their day has been covered so that they are as most at ease as possible on their wedding day. By two weeks before the wedding date, everything should be in place and any stress should start turning into excitement. If all the bride is responsible for on her wedding day is stepping into her wedding dress, my goal has been met. 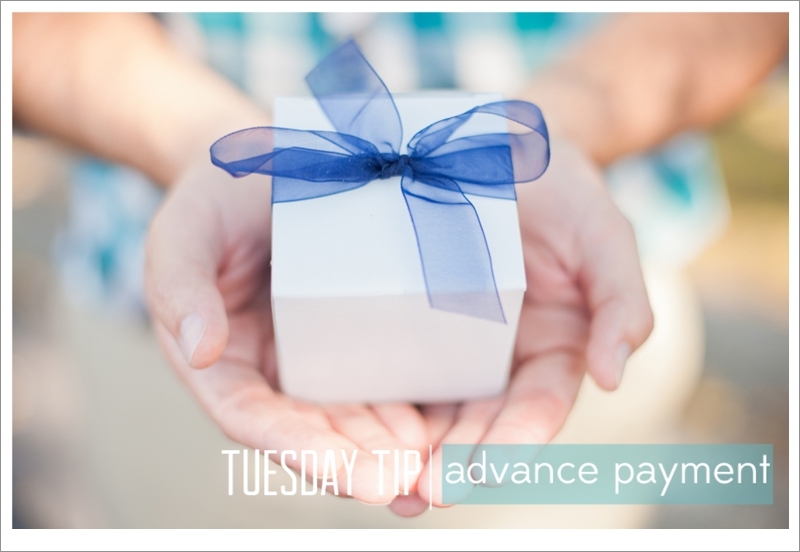 My hope is that by speaking to this subject for today's Tuesday Tip, it will help brides successfully budget for their big day and be as prepared as possible. If you have additional questions or thoughts, please comment below and let's get through this money matter together!